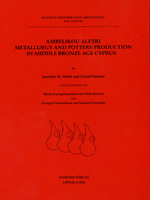 This volume presents the full documentation, analysis and discussion of the excavations carried out by Porphyrios Dikaios in 1942 at Ambelikou Aletri. The site lies to the west of the modern village of Ambelikou, northwest of the Skouriotissa copper mines, in the northern foothills of the Troodos Mountains. It has always been known for the evidence of copper mining and processing through the discovery of Middle Bronze Age pottery in modern mines and the casting moulds and other evidence for metal processing at the site itself. Less well known is a potter’s workshop. Here the catastrophic abandonment of the workshop, its installations and artefacts (including some four dozen jugs from the last kiln load) provides an insight into aspects of craft practices shortly after 2,000 BCE.